Avi (Poppy's Return) turns the multifaceted theme of transformation this way and that in five provocative tales. In ""Bored Tom,"" a listless 12-year-old, envying his cat's nap-filled existence, agrees to swap lives via the intercession of Maggie, a ""wizard-cat,"" who ultimately one-ups both former boy and former pet. The witty premise of ""Babette the Beautiful"" involves a 16-year-old princess born invisible after a crone abets a vain queen's wish for a flawless daughter; Babette struggles toward self-knowledge, literally piecing herself together in mirrored rooms full of human parts. The stories nimbly incorporate folkloric motifs and archetypes, and feature a pleasing assortment of talking animals. Characters suffer moral consequences for their greed, vanity and dominion over the powerless, whether human, bird or beast. 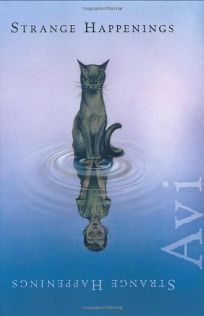 In the first and last pairs of stories, deft narratives consciously incorporate the wry omniscience and plainspoken diction of traditional folk tellings For the centerpiece, ""Curious,"" Avi, while still probing an ancient moral (""curiosity killed the cat"") adopts a matter-of-fact tone and modern setting. With its clever mix of magic, mystery and a soupcon of sci-fi (plus a captivating cover, to boot), this collection will please Avi's fans and may well draw new ones. Ages 8-12.